Cynthia is a tough, no-nonsense teenager who just wants to go to school, ride her razor scooter, steal food for her blind father, and generally stick to that routine. Unfortunately, everything around her is dying. Her pet bird, the frog in the forest, the man in the car accident, and years ago her mother. Ghosts even seem to follow her wherever she goes. They are trying to tell her something. Her eccentric dad thinks she has a powerful gift, but her not-quite-boyfriend Greg thinks that anything supernatural is bunk. In Hackles, Cynthia finds her own way through the riddles of the underworld to see if anything besides silence lies beyond death. 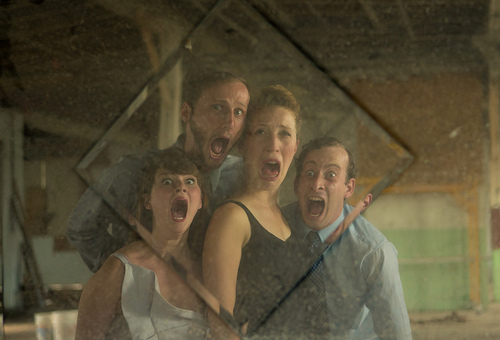 Hackles is an ensemble-based piece of devised theatre that premiered in Philadelphia’s White Space as part of the 2012 Philadelphia Fringe Festival. The actor/creators included LRS Co-Directors Alice Yorke and Scott Sheppard as well as Philadelphia theatre artists Martha Stuckey and Nick Gillette. The piece was directed by LRS Co-Director Mason Rosenthal.